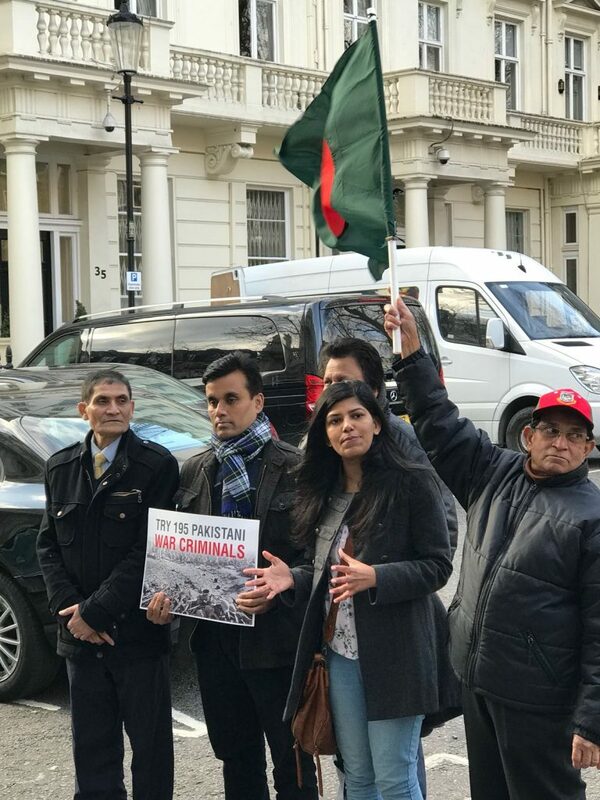 London: A public demonstration was held outside Pakistan High Commission in Knightsbridge, London on Thursday, 22nd March 2018 by expat Bengalis demanding the trial of 195 Pakistani military officers implicated in committing war crimes during the Bangladesh War of Liberation in 1971. The organisers said that it has been 47 years since the independence of Bangladesh and of one of the bloodiest genocide in human history, yet Pakistan is still in denial. Not only that, but Pakistan has dared to interfere in Bangladesh’s War Crimes Tribunal and even passed a resolution in their parliament against the tribunal. It is high time that Pakistan repent for their crimes. Following the demo, a memorandum was handed in by Journalist Matiar Chowdhury and Ajanta Dev Roy demanding the trial of 195 officers, repatriate 500,000 stranded Biharis to Pakistan, return assets belonging to Bangladesh, compensate war victims and to stop spreading Islamist terrorism across South Asia. 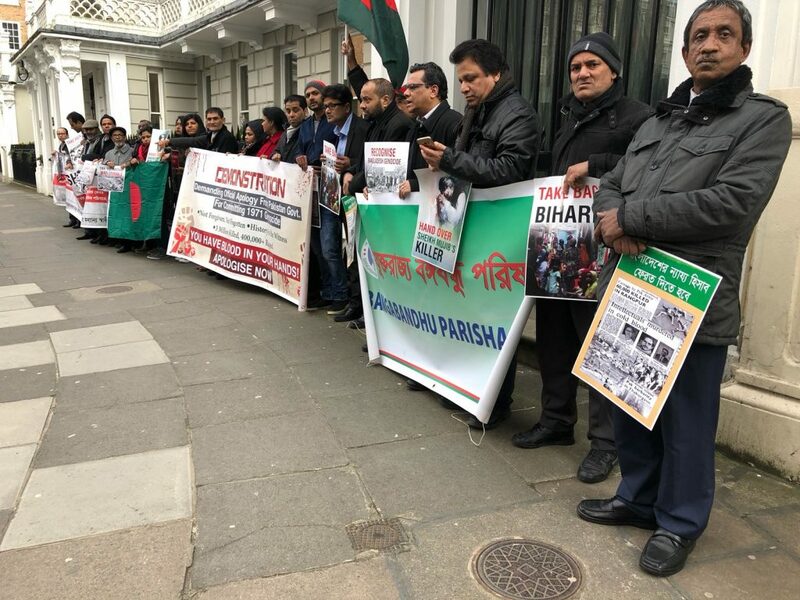 The demo was addressed and jointly organised by Matiar Chowdhury & Dr Anisur Rahman Anis of War Crimes Trial Stage UK, Syed Enam of Ghatak Dalal Nirmul Committee UK, Projonmo 71, UK, Ajanta Dev Roy Gonojagoron Moncho UK, International Crimes Research Foundation, Alimuz Zaman of Bangabandhu Parishad, Harunur Rashid of Udichi, Goyasur Rahman Goyas of Bangladesh Socialist Party, Redwan Khan of JASOD, Batirul Haq Shorder of Bangabandhu Writer & Journalist Forum, Shah Mustafizur Rahman Belal of BiswaBangla News24.Com, Bangladesh Human Rights Council UK, Rahela Sheikh, Syeda Naznin Sultana Shikha, Sinthia Arefin, Kamrul Hassan Tushar, Mahbubur Rahman khukon, Baristar Nizum Mazumdar, Freedom Fighter Shah Enam, comred Moshud Ahmed. Mubarok Ali, Anjuman Ara Anju, Mazumdar Ali and representatives of other pro liberation organisations.